Don’t let luck trip over junk while walking into your home or business premise. Declutter today to let luck flow in freely in 2018! Prior to Chinese New Year, every nook and corner of the home and office will be cleaned. Dust and clutter is traditionally associated with the old, so cleaning and getting rid of it symbolizes bidding farewell to the old and welcoming the NEW. 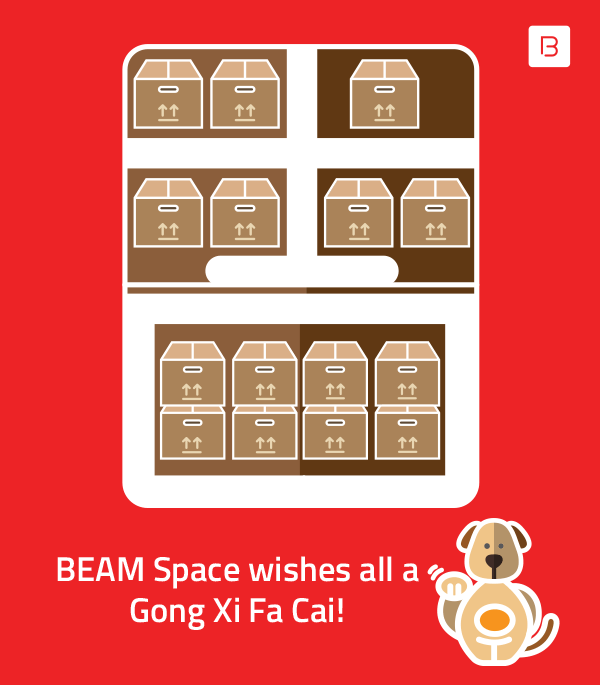 To enjoy this offer, download the BEAM Space mobile app for iOs or Android and enter the promo code ‘CNY2018’. Credits from this offer only applies towards storage charges. The promo code must be applied before 31st March 2018 to enjoy this offer. This promo code is only valid for users who are storing items for the first time. This promo code is not valid with other promotions or special arrangements. Call us on +603-92121586 or email us if you still have any questions and our friendly concierge will guide you thru.